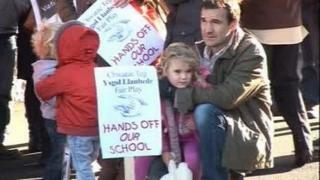 A small primary school in Denbighshire could still be closed despite the education minister refusing to shut it. Ysgol Llanbedr Dyffryn Clwyd has only 22 full-time pupils but Denbighshire council's closure proposal was rejected last month on a technicality. But now a second council consultation is set to be launched with a view to closing it in the summer of 2016. The St Asaph diocese said it is "astounded" by the move and the local AM says it "smacks of sour grapes". Clwyd West AM Darren Millar said: "The decision to proceed to seek a further consultation on closure is an insult to pupils and parents and we will not give up the fight to secure the future of the school," he said. The council said it will discuss the school's future "carefully". Ysgol Llanbedr is a Church in Wales primary school and council officials plan talks with the St Asaph diocese, if the cabinet gives the new process the go-ahead at a meeting next week. The school also has 11 part-time pupils and although numbers are expected to rise, the council believes surplus places will still be an issue and affect the school's long term viability. The council had originally wanted to close the school last summer with pupils being offered places at Ysgol Borthyn in Ruthin. Cabinet lead member for education councillor Eryl Williams said: "It was clear from the minister's report that whilst he was broadly in agreement with the proposal, the consultation did not provide some important information." It is expected a further report will go to the council in May. But the diocese said the education minister had found significant flaws in the consultation and it was shocked the council had decided to reconsider the proposal less than a fortnight later. "We are astounded that Denbighshire County Council has not formally consulted with the diocese before announcing its intention to restart the consultation process on closing the school," said Rosalind Williams, director of education and lifelong learning at St Asaph diocese. "To recommence a consultation to close this school after three years of uncertainty cannot be in the best interests of the learners or the wider community." She urged a period for officials to "pause and reflect" before opening a dialogue over the school's future. Is it OK to pay someone to have your baby?